On Sunday, I went for brunch at a friends’ house. It was all fine and I was enjoying all the vegan-proof food I had on my plate UNTIL someone offered me a piece of hot-from-the-oven chocolate brownie. Uh oh. It smelled divine and it was crispy around the edges and gooey in the middle, but it wasn’t vegan. And when I take on a challenge, I fully commit, so I stayed strong and didn’t have a piece. Later that day however, I still had those brownie cravings so I decided to bake a vegan brownie. It turned out to be one of the best chocolate things I’ve EVER made. In my humble opinion, it’s even better than regular brownies! Yes, I said it. And they’re super easy to make, even for you non-kitchen-goddesses! 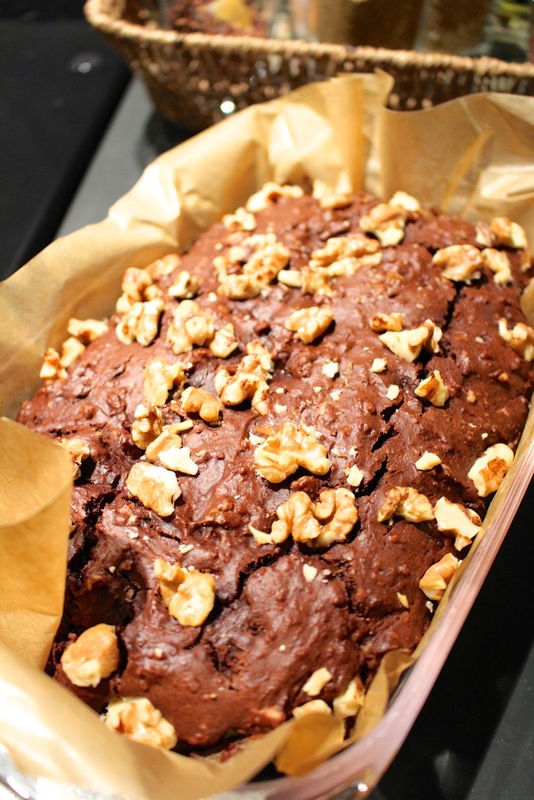 I followed Jamie Oliver’s vegan brownie recipe for about 80%, but replaced the pecans with walnuts (so much tastier! ), added a little more oil and reduced the sugar by two thirds because it’s totally unnecessary. It turned out perfect! Preheat the oven on 180 degrees Celsius. Sift the flour, cacao, sugar, vanilla and salt togetherin a bowl. Melt 150 grams of the dark chocolate au bain marie or in a little pan on very low heat. Chop up the remaining 50 grams of chocolate into rough chunks. Once the chocolate has melted, add to the flour, together with the milk and oil. Stir well until it’s all combined and has formed a smooth batter. Add a bit more milk if it’s too sticky / not runny enough. Now add the chopped dark chocolate. Chop up the walnuts roughly and add about two thirds of it to the batter, stir well until it’s all nicely combined. Transfer the dough into a baking tin lined with baking parchment (alternatively use one of those silicone ones). Sprinkle the remaining 1/3 of the walnuts on top. Now pop it into the oven for about 25 minutes. Check with a skewer, there’s shouldn’t be any sticky batter sticking to it. But also don’t leave it in for too long or the brownie will be too dry. Leave to cool and enjoy it when it’s still a little warm, it’s the best! The result is a very rich chocolate-y brownie with a semi-crumbly yet chewy texture and a nice crunch thanks to the walnuts. The chocolate chunks have nicely melted into the batter. Yummmm! Honestly you can hardly tell that this brownie is vegan, it tastes just like the real deal, but then without the butter and eggs. And the very best thing about this recipe? You can lick the bowl & spoon (come on we all do it) without fearing that you’ll get salmonella. Vegan batter or cookie dough is safe to eat :) I can’t think of anything else I want to say about it, apart from: Make this brownie!! Unless you don’t like chocolate of course ;) Otherwise, let me know in the comments or on Instagram how it turned out!